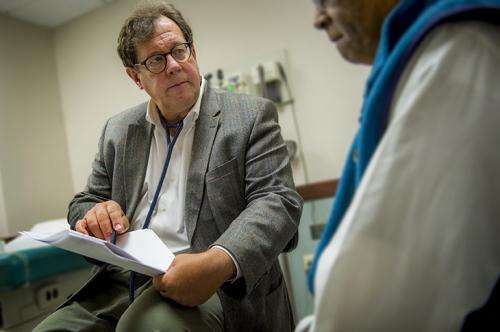 A widely used treatment for prostate cancer may cause more harm than good for some patients, according to Dr. Oliver Sartor, medical director of the Tulane Cancer Center. For decades, many men diagnosed with prostate cancer were treated with androgen deprivation therapy (ADT), injections that suppressed testosterone production. Sartor's research has revealed and a new study corroborates this is the wrong approach for selected men with localized disease, as it provides no added survival benefit and may be associated with other serious health issues. "Men with advanced disease, or certain men with aggressive disease confined to the prostate gland, are potential ADT candidates," said Sartor. "Testosterone suppression can increase radiation cure rates for certain aggressive cancers, and it is standard of care for metastatic disease." For years, though, many doctors used ADT for men with low-grade, prostate-confined cancers. "We now have good evidence this treatment may cause more harm than good for these individuals," said Sartor, "especially patients with slow-growing tumors who are not likely to die of their disease." The reason? ADT can potentially lead to health issues, including hot flashes, loss of libido, fracture risk, muscle loss, fatigue, depression, diabetic risk, erectile dysfunction and weight gain. Of the 240,000 new cases of prostate cancer diagnosed in the U.S. each year, over half are early stage and low risk. So what's the bottom line? "Many men diagnosed with prostate cancer may not need to be treated," said Sartor. He suggests instead "active surveillance" for many men with low-grade, localized disease. Active surveillance for selected patients is now endorsed by multiple urologic and oncologic national guideline committees, but has been slow to be accepted in many community settings. Sartor has been offering active surveillance in his practice for over a decade.